25 74550-2689 - 7/16 Round/axle Bushing (black). 60 74550-4129 - Battery Retainer. 49 0801-0220 - 10 X 1inch Screw. 47 0801-0304 - No. 10 X 1-1/4 In. Bolt. 14 0801-0221 - No. 6 X 1-1/2 In. Screw. 56 74550-2719 - Dash Knob. 29 74550-2299 - Wire Harness Holder. 74550-9809 - Wiring Harness Assembly (include No.5). 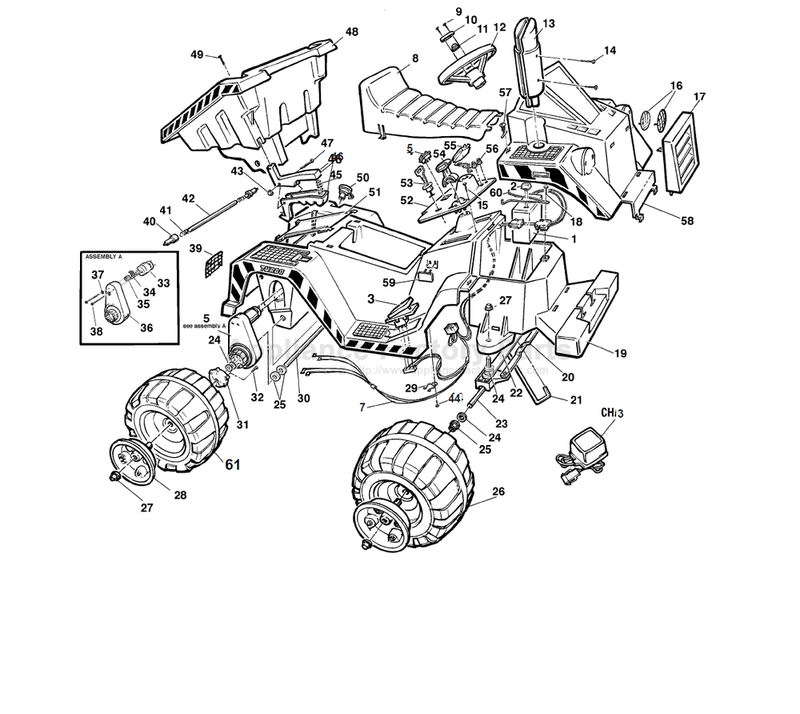 74550-2109 - Main Body (include No. 50 And 59) (n/a). 21 74550-4239 - Steering Column. 40 74550-2189 - Hinge Bullet. 42 74550-4139 - Dump Pivot Pin. 44 0801-0202 - (1) # 8 X 1/2 Screw. 41 78656-9259B - Hinge Spring. 13 74550-255A - Exhaust Stack. 48 74550-238A - Dump Bed. Big Jake Dt. 61 74550-2469 - Rear Wheel.